Talkapedia: My Trip to Massachusetts! Well, I went to Massachusetts this weekend, virtually that is. 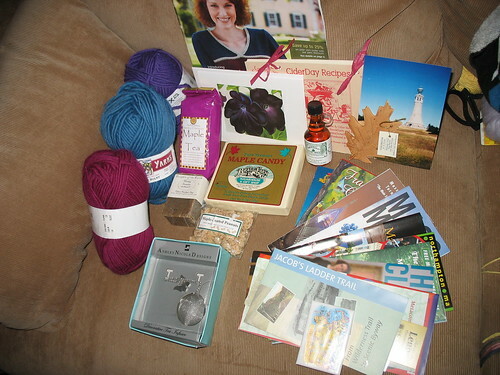 Yes, my Knitters Virtual Vacation Swap package arrived and what a trip I had. Thankfully, I have all these goodies to remind me. Brochures galore for all the sites I visited. Also, a postcard from Mt. Greylock - the highest in the state. Aimee took me to WEBS, where my brain overloaded and I now have no recollection. Thankfully, I have some yarn. And a catalog. (Aimee is such an enabler.) The yarn is yummy Berkshire Bulky in Fuschia, Colonial Blue and Amethyst. I've got Maple goodies - some syrup, a lovely Maple ornament, maple covered peanuts and some yummy maple candy (disappears fast, let me tell you). Also a tea infuser and some maple tea. Ooh - I love maple tea. Also, some local soap which looks divine. There is also a travel mug from Six Flags, but it did not want to be photographed, it kept rolling away and hiding. I also have a Massachusetts magnet and a Cider Day recipe book. I flipped through the recipes, and the Hot Apple and Potato Salad - for example - sounds delicious. So, thanks, Aimee for a great trip!